Being a Pancreatic Cancer Survivor, as Tom has been for the past 4 1/2 years is truly an oxymoron. The first step was surgical to remove traces of the cancer and parts or all of the organs that the cancer cells had attached to. Next was 6 months of Chemotherapy. Aided by alternative and Naturopathic support, the next 3 years Tom was cancer free, and he vowed to live life with passion, energy, including dancing several days a week and being an active member of his community. He and his wife Mindy, have gained a wealth of knowledge on what supports the body and immune system dealing with the onslaught of cancer, chemotherapy and challenging drugs. Most everything Tom has chosen in his survival with cancer has been naturopathic and alternative including: IV therapy (high dose Vitamin C, Mistletoe, and immune supports), more than 50 daily supplements, Energy Medicine (Tom trained and after 3 years of study, became a Certified Eden Energy Medicine Practitioner) and recently, Hyperthermia treatments, available only in British Columbia have been added to his survival regime. All of this comes out of Tom's pocket because our medical system will not support any of it with the exception of chemotherapy. If Tom had used Chemotherapy alone, he would no longer be alive and we would not be asking for your support. So now a call, to help this family as Tom seeks out effective, alternative treatment to Pancreatic Cancer. These alternative treatments are not covered by insurance, but Tom is living proof that they work. Next week he is going back to British Colombia for his second round of intensive hyperthermia treatment and I am hoping that our town, of which Tom has been a member of for decades can help him with this expense. His last round of hyperthermia treatment was a success, his tumors shrank! This is a call for those of us who believe in the power of holistic treatment, who believe that local, organic food can nourish and heal the body and soul, a call for us, as a community to help Tom for all the years he has volunteered as a board member of too many organizations to list, as a provider of local food and purveyor of permaculture knowledge. I am asking our little mountain town to help this man with his battle against cancer. We are eternally grateful for donations of any size, however, for donations over $110, Tom is offering an Energy Medicine session. 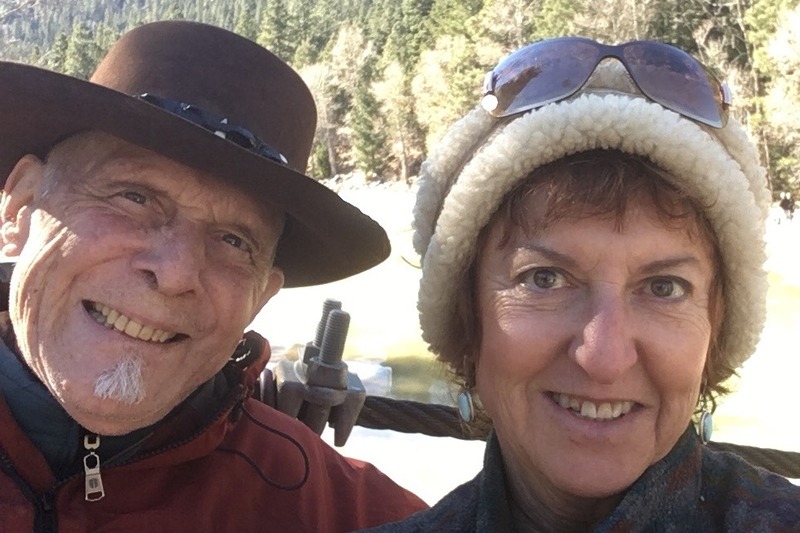 For larger donations from people afar, Mindy and Tom would like to open their home for an evening stay in Durango, where you can partake in a wonderful organic dinner, an energy session or a massage (provided by Mindy who has 30 years of experience in therapeutic massage). Thank you for your donation. A thank you again to all of you who have donated to or shared about the challenges we have been facing fighting pancreatic cancer. Without your help it is hard to say where I would be today! Extended gratitude to all of you who responded to my email with the names of friends or family living in or near Seattle. We have been incredibly fortunate – a miracle really -- to have connected with a very generous couple who live in Renton only ten minutes from my clinic. There we can park our RV, connect to power, use the bathroom, a bedroom and kitchen when we need them. That has been a real boon as you will see below! We have now been in Seattle for one month, and Mindy and I have begun to explore the area. Lake Washington divides the city in half—there is a 126 mile long bike path around it. Last Sunday we visited Magnussen Park on the NW shore and discovered a beautiful and interesting part of town. Wednesday night to celebrate the 6th anniversary of our meeting in Vietnam and our 2nd wedding anniversary we went to Jazz Alley in downtown Seattle to see Tuck and Patty – a duo that Mindy first saw in Atlanta in the 80’s. They were Fantastic! She has the voice of an angel and he is such master of his guitar. Their music was sublime and so soothing. Now as to the health update: I have received four treatments of Dr. Chen’s special protocol number one (my designation). Unfortunately things have not gone quite as we had anticipated. This protocol has given me such severe neuropathy that my mobility has been severely impaired, so that I now have to use a walker to get around and my hands do not function, making typing or opening a bottle of water a huge challenge. Yesterday I switched to protocol number two in which the series of treatments should have no neuropathy side effects. I am expecting (hoping) that my body will soon return to normal so that I can be self-maintaining as Mindy has had to be my caretaker, meal preparer and "fetcher." She really needs a break! The good news is that the cancer treatment is working! Last night I was not able to feel either of the 3.5 cm tumors on either side of my abdomen and in Dr. Chen’s office, his staff was also not able to feel the mesenteric tumors. Your prayers, donations, shares and communiques are vital to our journey and so we ask you continue as you can. Spring is very evident and early as we get more familiar with our new surroundings. We know there are many facing challenges in their lives and we feel much gratitude that you care and share as we move along in our life’s journey. The news in this latest update is mixed: there’s both good and bad. The respiratory ‘crud’ that has been circulating this winter hit Tom very hard and landed him in the hospital with pneumonia. It was there that we discovered that his oxygen saturation was surprisingly low and he is now on oxygen, hopefully temporarily. The 12 week series of low dose chemotherapy just completed also depleted Tom’s red blood cell (RBC) count, contributing to the difficulty with oxygen absorption. Due to this threatening RBC depletion, and mixed readings with the most recent CAT scan (some tumors are stable, while another has grown and a new tumor appeared), Mindy and Tom made the decision to move up to Seattle as quickly as possible. This is in order for Tom to receive a unique 3 month protocol of treatment with our main Oncologist, Dr. Chen. He has used this protocol with other cancer patients who had been terminal and at the completion of the treatment, went into remission. The cancer marker test results have dropped significantly in the past 3 months, from a startling high of 2800 to the most recent result of 264 (< below 35 is considered normal). That offers us some good news and encouragement. The challenge is the tests are not always reliable and with the mixed CAT scan reports, less so. Hence the need to take a new course of action and soon. Tom and Mindy will be driving up to Seattle in a week (mid- February), living out of their 25 ft RV with their girl dog, Athena. We will endeavor to approach this new phase of treatment and challenge with the spirit of adventure and in the pursuit of random beauty and kindness!! Anyone who lives in the Seattle area/Pacific Northwest or has friends that do, would you please ask them or yourselves for support such as a place to park the RV for a couple of nights, take a shower and especially share community and loving kindness. All of you who have contributed resources and shared our site with others have made such a great difference, allowing Tom to continue his treatments at times when little or no financial resources were available. For that we both feel such great gratitude. It gives us the stamina to keep living, loving, learning and fighting the good fight! Goddess Bless you all for sharing the power of love over fear!!! I want to thank all of you who made donations in support of my recent trip to Seattle and Fort Langley, BC. We received more than half of the projected cost of that trip and are $2000 short of covering the full cost. The good news is that we have substantially reduced the Cancer marker (from almost 2800 to 890), I am feeling better, and the signs are looking good. Still waiting for the radiologists to make sense out of the last three CT Scans. They are as close as you can get to what is actually happening. There may be one more trip north in a month or two. Thank you all for your continued support, and may you all have a very Happy New Year!! p.s It was very windy on 12/20 in Fort Langley and a trampoline got blown up into the powerlines and blew a transformer, so it became an even darker day! Power didn't come back on until almost 9pm -- five hours after sunset! 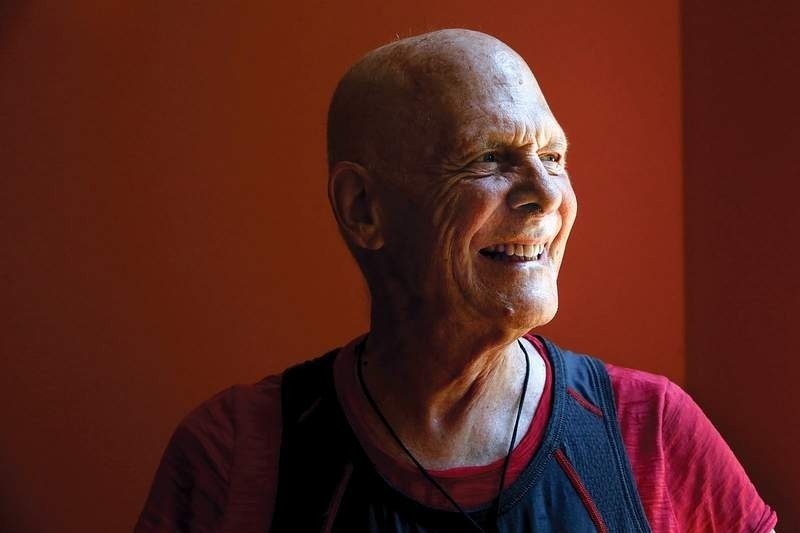 Mary Shinn wrote an insightful article in THE DURANGO HERALD,( Sept. 3,2018) https://durangoherald.com/articles/239522-durango-man-living-full-life-after-pancreatic-cancer-diagnosis that chronicled the challenging journey Tom Riesing and I – his wife Mindy – have been living “Defying the Odds” staying well with Pancreatic Cancer. The article examined the allopathic and alternative methods and choices we have made during this 5 year journey. I am writing this update to share more information and to clearly ask for help. During this past year Tom has gone from being almost cancer free to having new tumors appear in his abdomen and experiencing the biggest setback we've experienced during the 5 years. It is clear that more hyperthermia treatments are needed immediately and they are only available in British Columbia. This past summer we experimented with an immunotherapy drug to see if it would eradicate what was left of three small tumors in Tom's lungs (the Nobel prize in Medicine was JUST presented for this radical new treatment). Even though it has met with some success, this was not the case for Tom. Instead new tumors appeared in his gut (actually in the mesentery which holds the small intestine in place). Last winter we had great success with the combination of intravenous Vitamin C, low dose Chemotherapy and hyperthermia. That approach reduced the size of the three tumors in his lungs by factors of 8 to 10. Tom's three primary Oncologists/Naturopaths now urge Tom to resume Hyperthermia (heating) as part of his current treatment plan. This is where we need your help to pursue this most effective treatment protocol. Two weeks of treatments & travel expenses will cost about $4500. All of Tom's discretionary funds have been used and his savings and retirement funds have been drained during this 5 years of vigilant treatments, supplements and testing. There are few of us in this day and age who don't know someone fighting for their lives or who already have had cancer rob them of a beloved, a friend or a colleague. Please help us give Tom the chance to not be just another statistic, but to receive the treatments that have made a difference and have allowed Tom to 'DEFY THE ODDS'. PLEASE MAKE A DONATION TODAY and Please share on Facebook or Twitter. And please know that Tom is still dancing NIA, active in the community as a board member of Durango Natural Foods and fighting the Good Fight! !